ACSA announced that the SeaExplorer glider (featured on this month’s cover of Marine Technology Reporter), developed by ACSA in partnership with ACRI, CNRS and IFREMER, completed a two-month record mission in collaboration with the Laboratoire d’Océanographie de Villefranche (LOV) of National Center for Scientific Research (CNRS) and Pierre and Marie Curie University (UPMC). “The mission objective was to evaluate the endurance of our first glider equipped with rechargeable batteries while performing several round trips between France and Corsica Island” said Dr. Hervé Claustre of the CNRS LOV. ACSA introduced rechargeable Li-Ion batteries as an effective, reliable and affordable solution. 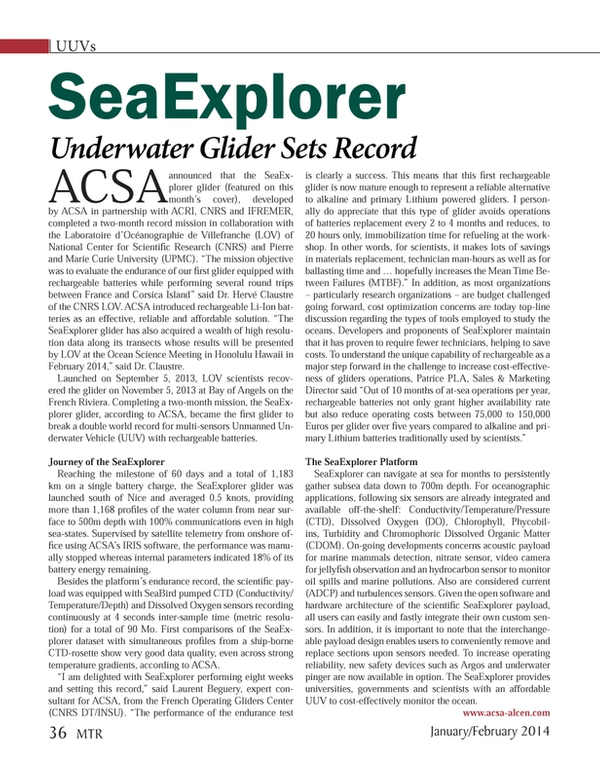 “The SeaExplorer glider has also acquired a wealth of high resolution data along its transects whose results will be presented by LOV at the Ocean Science Meeting in Honolulu Hawaii in February 2014,” said Dr. Claustre. Launched on September 5, 2013, LOV scientists recovered the glider on November 5, 2013 at Bay of Angels on the French Riviera. Completing a two-month mission, the SeaExplorer glider, according to ACSA, became the first glider to break a double world record for multi-sensors Unmanned Underwater Vehicle (UUV) with rechargeable batteries. Reaching the milestone of 60 days and a total of 1,183 km on a single battery charge, the SeaExplorer glider was launched south of Nice and averaged 0.5 knots, providing more than 1,168 profiles of the water column from near surface to 500m depth with 100% communications even in high sea-states. Supervised by satellite telemetry from onshore office using ACSA’s IRIS software, the performance was manually stopped whereas internal parameters indicated 18% of its battery energy remaining. Besides the platform’s endurance record, the scientific payload was equipped with SeaBird pumped CTD (Conductivity/Temperature/Depth) and Dissolved Oxygen sensors recording continuously at 4 seconds inter-sample time (metric resolution) for a total of 90 Mo. First comparisons of the SeaExplorer dataset with simultaneous profiles from a ship-borne CTD-rosette show very good data quality, even across strong temperature gradients, according to ACSA. SeaExplorer can navigate at sea for months to persistently gather subsea data down to 700m depth. For oceanographic applications, following six sensors are already integrated and available off-the-shelf: Conductivity/Temperature/Pressure (CTD), Dissolved Oxygen (DO), Chlorophyll, Phycobilins, Turbidity and Chromophoric Dissolved Organic Matter (CDOM). On-going developments concerns acoustic payload for marine mammals detection, nitrate sensor, video camera for jellyfish observation and an hydrocarbon sensor to monitor oil spills and marine pollutions. Also are considered current (ADCP) and turbulences sensors. Given the open software and hardware architecture of the scientific SeaExplorer payload, all users can easily and fastly integrate their own custom sensors. In addition, it is important to note that the interchangeable payload design enables users to conveniently remove and replace sections upon sensors needed. To increase operating reliability, new safety devices such as Argos and underwater pinger are now available in option. The SeaExplorer provides universities, governments and scientists with an affordable UUV to cost-effectively monitor the ocean.